readinghorizons.com■Retail Price: Reading Horizons software provides unlimited access for $100 per student as part of a school-wide package; however, there are many pricing options. Based on research-driven strategies, Reading Horizons Discovery is a program for teaching and assessing K–3 reading skills. Quality and Effectiveness: Reading Horizons Discovery offers lessons, assessments, tests, and games to teach students basic reading skills. The program tracks each student’s progress and differentiates instruction as students move through the program. At the kindergarten level, lessons precede assessments, then as students progress they take assessments first, to determine if the lesson is necessary. Instructors are able to override this feature for the whole class or for individual students and can also assign specific lessons to students who need additional instruction. Assessments at the kindergarten level are shorter and more frequent. Reading Horizons Discovery offers lessons on the 300 most common words (sight words) and uses 74 Lexile-leveled stories to engage students and assess comprehension. Ease of Use: Reading Horizons Discovery can be used online or installed on a server or an iPad. The iPad apps (Clubhouse, Vocabulary, Library, Games, Card Match, and Whack-a-Word) make it easy for students to access the program from home or the classroom. Navigation is intuitive and students view a video the first time they log in to the online version, which gives them a detailed tour of the program. Creative Use of Technology: Reading Horizons Discovery provides incredibly detailed reports, assessing reading skills such as phonemic awareness, spelling and word recognition, reading speed, and comprehension, so instructors have a full view of student achievement and improvement. Instructors can also track the amount of time spent in the program and on individual assessments and lessons. Reports are available for individuals and for the whole class. Reading Horizons Discovery sends alerts, including suggested interventions, to teachers when students are struggling. As they work through the lessons, activities, and assessments, students earn coins that they can use to decorate their clubhouse or purchase game time. The library contains books that “unlock” as the student progresses, and there are comprehension questions for each book. Students can also choose to have a narrator read to them, exposing them to fluent reading and increasing their listening skills. Suitability for Use in a School Environment: Reading Horizons Discovery is fully aligned to the Common Core Standards for ELA for Foundational Skills and Language Standards and offers detailed reports on which standards are addressed by each lesson. Reading Horizons Discovery offers two tracks—instruction and activities. The activities track uses assessment first, followed by instruction when students do poorly on assessments; the instruction track delivers instruction first. This choice allows instructors to differentiate based on student strengths and weaknesses. Instructors can preview all activities and lessons to select those they feel are best suited to their students. Reading Horizons Discovery is a perfect choice for assessing student reading skills and providing instruction and differentiation in the classroom. 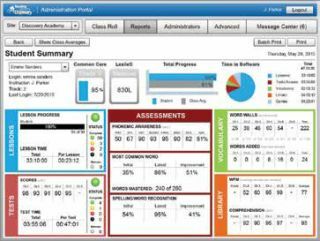 With the detailed reporting features, instructors can monitor student progress and provide individualized intervention where necessary. ● Powerful reporting—allowing instructors to zero in on what students need. ● Differentiation—instruction is tailored to each student’s strengths and areas of struggle. ● Student engagement—the game-like elements encourage students to work on their reading skills.